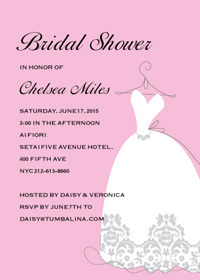 Congratulations if you’re getting married in spring 2012! 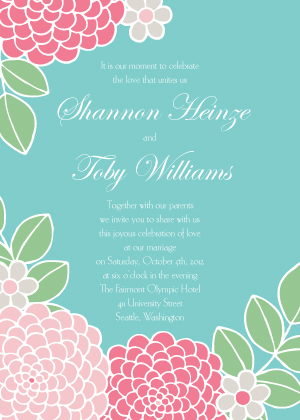 If you have yet to purchase wedding invitations for your spring event, consider the fresh and fantastic selection available at LookLoveSend.com. It’s generally recommended to mail invitations 8 weeks before the wedding, but our excellent fast service (orders ship the next business day) ensures you still have plenty of time if you order with us! So what is so special about spring weddings? The first thing that usually comes to mind is the flowers. Spring flowers such as tulips, daisies, roses, peonies and among the prettiest and most colorful of all blooms – but blooming branches such as cherry blossoms, quince, or dogwood are all modern options that symbolize spring. And if you want to feature a specific spring flower in your wedding celebration, why not start with the wedding invitation? ‘Peonies’ by designer Yana Beylinson offers a classic and elegant glimpse of this special May flower. Color also plays a big role in spring weddings, but to liven up the traditional pastels choose brighter shades such as bold orange, lime green and magenta. And if you decide on a single color for your wedding theme, use a slightly different shade of the color on each reception table – this will add variety but avoid an overly matchy-matchy look. ‘Blooming Dahlia’ by designer Diane Kappa combines the beauty of flowers and vibrant color in its spring-like design. 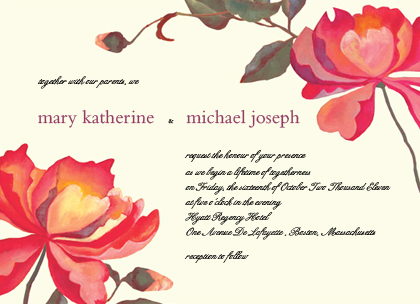 All LookLoveSend stationery designs include multiple elements including the invitation, response card, place card, menus and directions, all printed on superior quality paper stock. Enter our free January sweepstakes for a chance to win up to $500 off your wedding stationery with us!